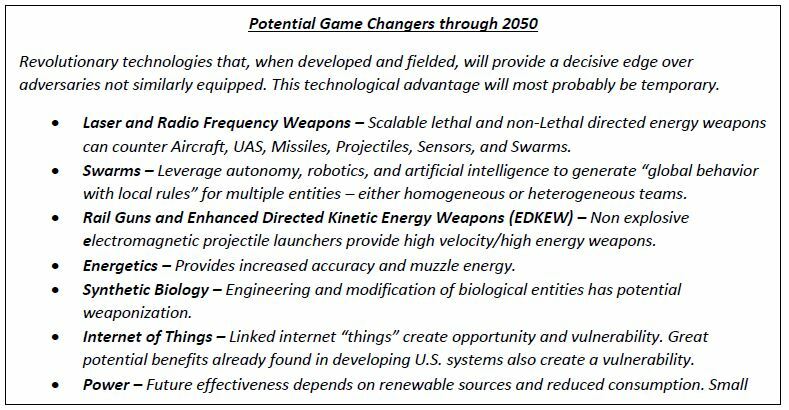 In July 2017 the US Army’s Training and Doctrine Command (TRADOC) published a report that described how a chaotic and uncertain future lies ahead for American power–whatever this still means beyond the 2020s. 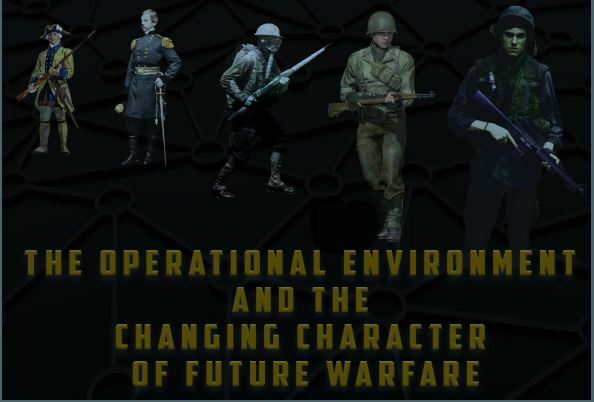 The Operational Environment And The Changing Character Of Future Warfare, hereby shortened to TOEATCCOFW, isn’t classified and is available as a free download. TRADOC even used its annual Mad Scientist Conference to promote it. The value of the 21 page report, whose ominous cover is crowded with badly photo edited images of American soldiers, is its most startling revelation: unfettered technological progress will bring about chaos. This is the cover art for TOEATCCOFW. The montage on the lower half beneath the title is even more embarrassing. The reader should keep in mind TOEATCCOFW isn’t meant to shape policy. It’s food for thought that should nourish the imagination of whoever enjoys gazing into crystal balls. It’s a speculative work underpinned by the anxieties of the present. The first page of TOEATCCOFW does make a very bold claim, that the middle of this century will be defined by two powerful trends. These are dubbed “The Era of Accelerated Human Progress, 2017-2035” and “The Era of Contested Equality, 2035-2050.” The latter is more controversial because the US’ role as an undisputed great power becomes uncertain at that point. To better illustrate their novel timeline TOEATCCOFW’s authors enumerate 12 trends that are manifesting today. It’s worth mentioning nine of them–big data, space, energy, social media, manufacturing, AI, robotics, mobile devices, and increased human performance–are connected with technology. 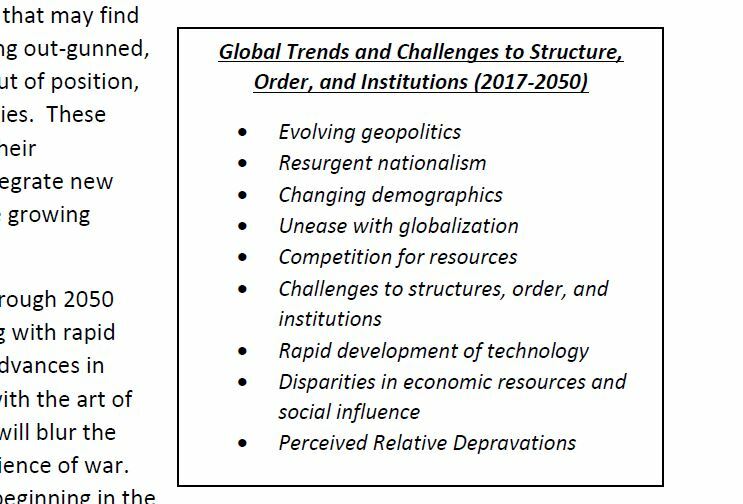 The three remaining trends, according to TOEATCCOFW, are “climate change,” “economic rebalancing,” and “demographics and urbanization.” Acknowledging the urgency of the three isn’t unique to this paper. The challenge of a rising China, for example, and the uncontrollable sprawl in capital cities across the global south have been fodder for wonks since time immemorial, it seems. TOEATCCOFW does go further and distills nine specific “challenges” from the 12 trends it listed. These nine problems aren’t exactly obscura picked at random from the fringes of specific academic fields. They’ve been apparent since the beginning of the century and are still fueling worrisome news headlines, like the Syrian civil war or the controversial US elections in 2016. If TOEATCCOFW serves as a harbinger of things to come then the reader must accept what ails us today will afflict us in the long-term. 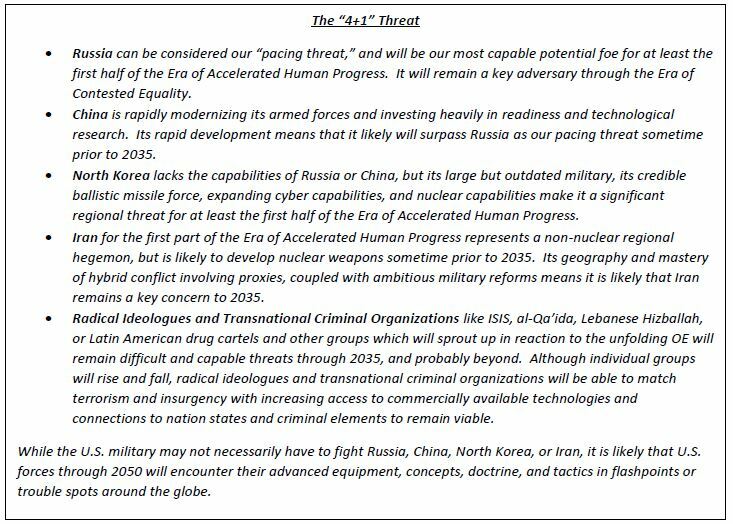 A list of countries found on page 6 points to where US military actions could materialize in the next 20 years. Of the 14 territories and geographies mentioned, only four are outside the Eurasian landmass. There seem to be no serious threats in the Americas, with Mexico and Colombia-Venezuela only listed as potential flashpoints. Another boxout is on page 7 where eight STEM fields are listed as disruptive influences on military affairs. (See above.) 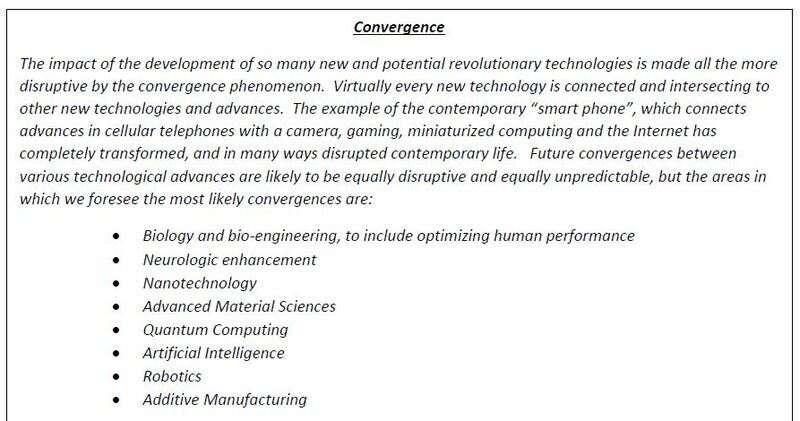 If these technological streams combine or hybridize, the “convergence” suggested by the authors, the resulting applications could alter how society functions and the way threats to US power emerge. TOEATCCOFW finally drops any pretense of being an idea box for dystopian science fiction and goes for the throat on page 10, where a boxout lists the “4+1.” These are the five entities, four countries and an ambiguous non-state actor, who are going to fight the US military in the coming decades. For some reason, the marginal threats posed by Al Qaeda-type organizations and drug cartels are lumped together. The justification is these shadowy groups will become more potent than the rebel guerrilla armies who populated unconventional warfare in the late 20th century. TOEATCCOFW does admit that either Iran or North Korea may disappear around the 2050s, meaning their governments may change or the country suffers a total collapse. Page 11 is another treat. 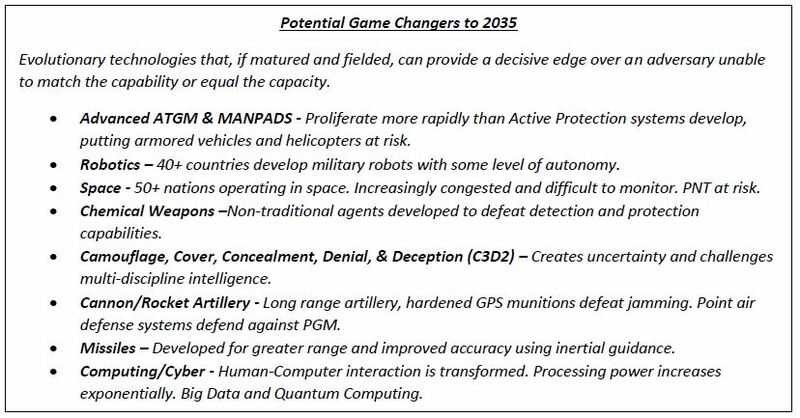 A boxout contains a list of weapon systems and technologies that can check the US’ superiority in contemporary war zones. The reader should take this particular segment to heart. Even small countries, should they wish, can acquire some very lethal capabilities at low cost. An extreme example is North Korea’s ultra-destructive war machine on a shoestring budget. But the authors behind TOEATCCOFW then pile on deadlier hardware on the way to mid-century. Of the seven killer apps mentioned, at least four are now commercially available. This means harmless consumer products utilizing the same technology can be bought without any restrictions, be they alternative or independent energy sources, wireless devices that are synced together, ominous swarms of small drones, and “radio frequency weapons”–devices that bring down the same ominous small drones. So according to TOEATCCOFW these capabilities, with a few more added, should became extremely destructive by the time millenials are approaching retirement age. One of the worst parts in TOEATCCOFW is the forecast on the “Contested Equality” era. It’s going to have two distinct norms, these are “the nation-state perseveres” and “Super-Power Diminishes.” So in TOEATCCOFW’s view countries as they are today will mostly survive, albeit weaker and less cohesive. At the same time, TOEATCCOFW believes there won’t be a single country who can rule the world as a result of too much violent competition. This is horrible. 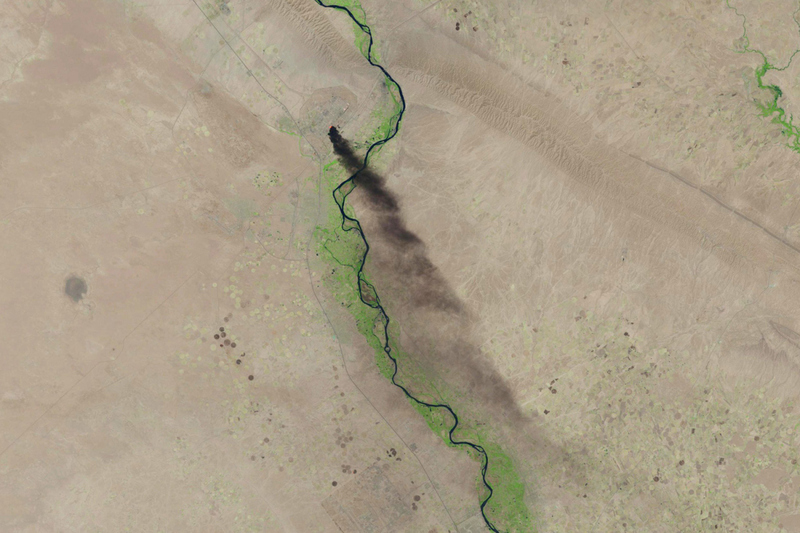 To darken its vision of a “deep future,” TOEATCCOFW anticipates a complete change in how the world understands warfare. This is discussed from pages 18 to 20. Another boxout is thrown in to highlight the US’ vulnerabilities should enemies from the “Contested Equality” era assault the American homeland. 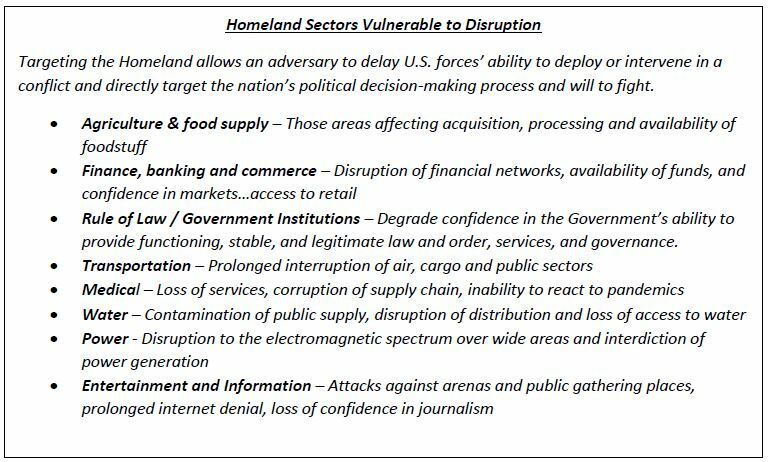 This part actually reads like a grocery list from a cybersecurity guide where everything mundane is a potential crisis. Distilling the ideas in TOEATCCOFW brings two new historic eras into focus. In the first era from 2017 until 2035 anti-American adversaries diminish the US’ hard power by embracing technology. In the second era from 2035 until 2050 no single nation-state enjoys a dominant position on the global stage. This is a clear sign that Washington, DC’s long shadow over the world may disappear for good and leave a vacuum. Whatever mastering interconnected competition means, it sounds as if the US Army is struggling to comprehend the how of winning future wars. Will it? Can it?